Besides making you look older, severely sagging skin around your eyes can reduce your side vision (peripheral vision), especially the upper and outer parts of your field of vision. Blepharoplasty can reduce or eliminate these vision problems and make your eyes appear younger and more alert. Blepharoplasty is usually done on an outpatient basis. “The eyes are the windows to the soul” is such a profound and beautiful quote by William Shakespeare…until your soul is obstructed by sagging, old skin! I have been blogging about the evils of gravity upon my face since 1/7/11 (see post “Helping Grace”). Almost six years later, you can imagine the accumulated carnage and ruin. In viewing photos of myself, I subconsciously cast and catalogue them by using the Seven Dwarfs Dewey Decimal system; Happy, Grumpy, Bashful, Sneezy and Dopey. When the majority of the photos were ALL ending up in the Sleepy pile…it was time to seriously call the last one…Doc. Two years ago, after winning an Oscar for the best tired and old portrayal of Sleepy, I banned all selfies, and participation in anything having to do with a camera. I had looked into an “upper bleph” several years before as over a dozen of my friends had gotten upper and lower blephs, and they looked amazing. The only reason I did not go ahead with the elective surgery was because the downtime for exercise was 4-5 weeks. There was no way I could not do a downward dog for that long. Hearing for the umpteenth time, “You look so tired, you must have had a late night,” when in fact I had slept for 9-10 hours was finally the impetus to go for an upper bleph consultation. Yuko, my little sister and Beauty Guru gave me the names of three top plastic surgeons in Honolulu. 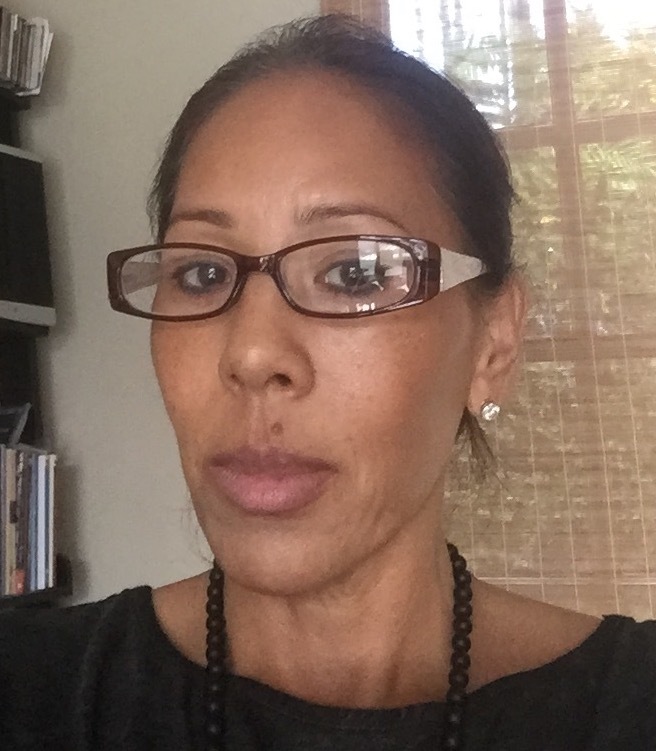 Yuko has the upclose-and-personal, intimate 411 on her patients’ reconstructive surgeries, and she is the best source on which doctors have the magic touch. I made appointments that week to see all three. The first doctor I scheduled to see was Randy Wong. Within the first 5 minutes, I knew he was the doctor for me, since I walked in and sat down in a room full of Tibetan singing bowls. I was informed that Dr. Wong has one for every chakra…Hello! the dude obviously spoke and subscribed to my dialect of spirituality. I learned that Dr. Wong meditates and practices Qigong for calming and centering before surgeries. He does not operate on full moon days, and he is huge advocate of my favorite law…the law of attraction! Within the first 5 minutes, I knew he was the doctor for me, since I walked in and sat down in a room full of Tibetan singing bowls. I was informed that Dr. Wong has one for every chakra…Hello! The most fabulous part of our consultation was when Dr. Wong informed me I was a candidate for a procedure he performs on reconstructive surgery newbies that are not quite ready to go under the knife. The procedure was developed in Japan, but Dr. Wong had tweaked and perfected it over the years. In lieu of a full upper bleph, I could get an eyelid stitching. There is no cutting involved, and it is akin to sewing up the hem of a pant leg. 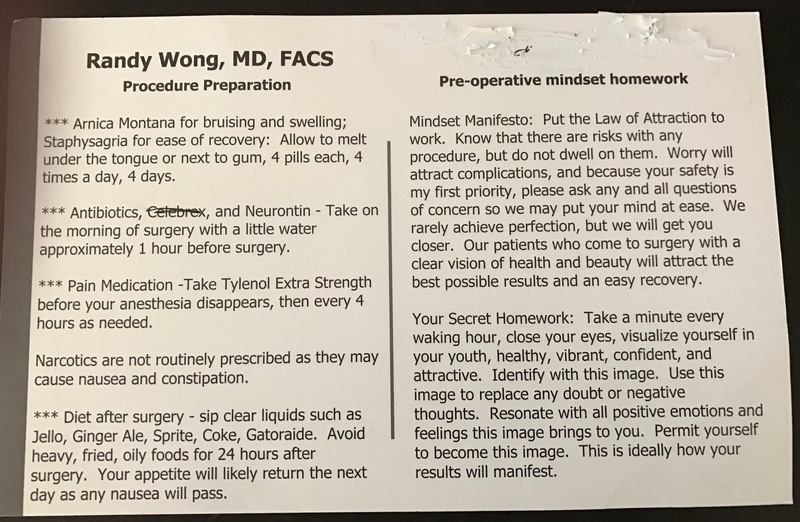 Dr. Wong basically pulls up and sews all the loose skin and then anchors it into the upper corner of your eyelid. The collagen grows around the thread and holds it in place, so there are no stitches to be removed. The beauty of it is that, if you do not like the results after the procedure, he cuts the stitches, and your eyelids fall back into place. You can then apply the fees from the upper eyelid stitch procedure toward an official upper bleph. If not satisfied with the results—one can apply the fee toward an upper bleph. Lasts from 2-4 years – will have to repeat at some point. After reviewing the list – it was a no-brainer for me…EYE STITCH…GAME ON! 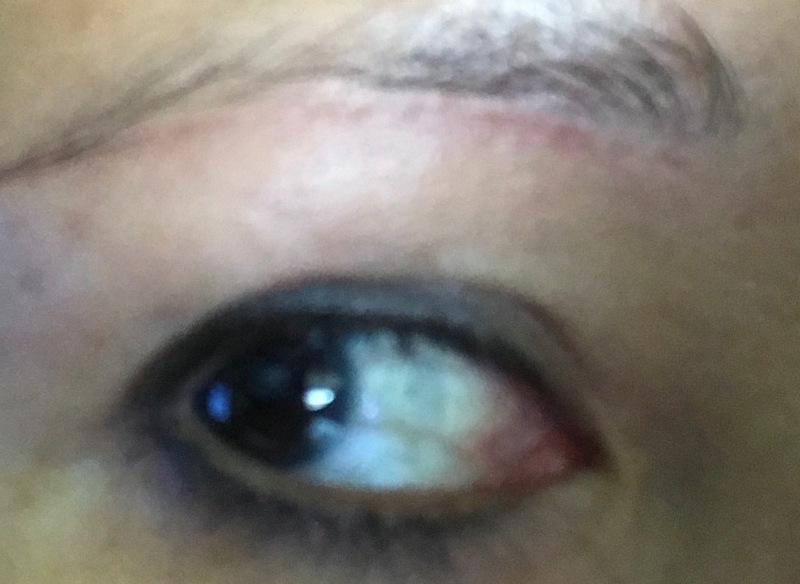 On December 9, 2014, I went in for my upper eyelid stitch. It literally took Dr Wong 15 minutes to do the procedure. 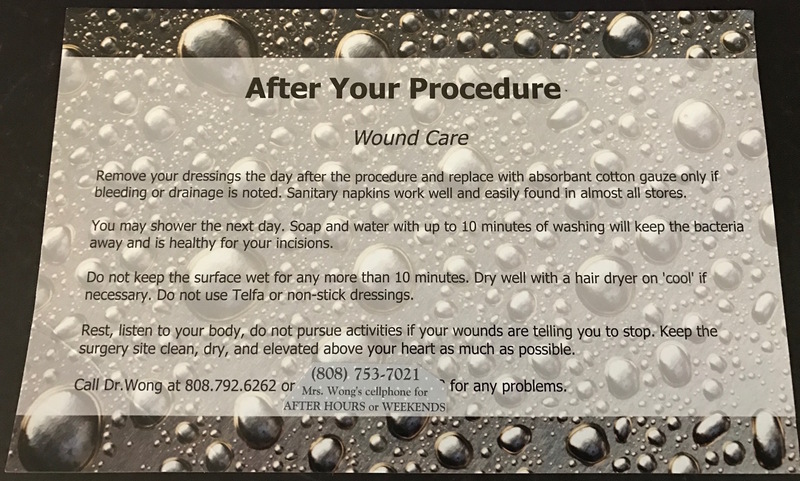 Of course that does not include the time involved to take pre-photos, the fabulous blue light laser therapy you receive after to kick-start the healing process, and the time for icing. I went home singing the tune to Rocky as my eyelids were pretty bruised and swollen. The only post-procedure instructions was to “Ice Ice baby,” and to do no vigorous exercise for a week. I have to admit, I was a bit alarmed at how high the final stitch was anchored. The conversation in my head went something like this, “Did Dr. Wong not hear me when I said I just want my eyes to go back to looking the way they used to when I was in my 20s? 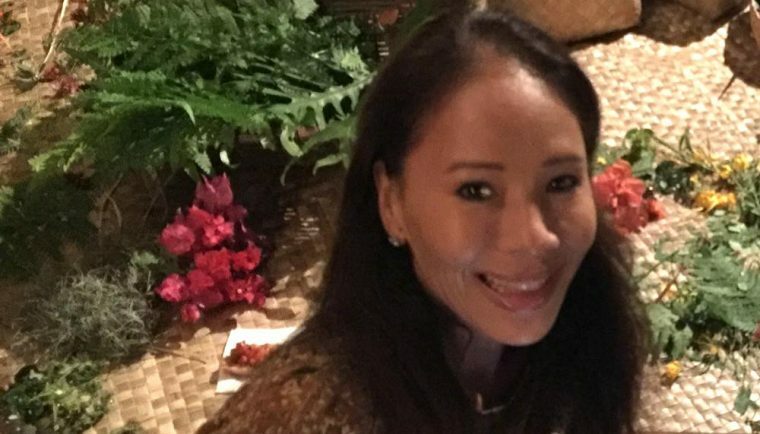 Did he mistakenly hear a request to look like the Queen of the Nile instead?” When I phoned Dr. Wong the next day, he reassured me that the the skin would fall naturally into place in the following weeks. The day after my eye-stitching, my eyes were not as swollen, and I was able to make a quick dash to Wholefoods. Each day the swelling and bruising subsided, and I discovered my 1.5 readers disguised the crazy eye of Ra Egyptian look I was sporting. Of course I got a little dizzy with my readers on but covert disguise is not my forte. *Note: If you decide to do this procedure, get 1.0 readers or find an inexpensive pair of frames with just clear glass in them. One month after eye stitching surgery. received several comments on how fresh I looked. To all of you in the Sleepy fan club, who are on the surgical fence, I can wholeheartedly recommend this procedure. It is exactly two years later, and guess what… Sleepy has buddied up with Old yeller and found his way home! The skin of my upper eyes had fallen 1/2 way back to pre-eye stitch era, and I knew it was going to be a swift, downward slippery slope from there. It was time to go under the knife. My consult was like “Groundhogs Day”, as Dr Wong and I had the exact same discussion we had during our first consultation 2 years prior. Yes, I could have re- sewn my eyes, but when I learned what an upper bleph entailed, I was pleasantly surprised it was not going to be much more involved. The only differences were: it is not reversible, it lasts longer and costs 1/3 more. I was delighted to learn I only had to refrain from vigorous exercise for one week. Of course, I had to bring up again my sagging face, and I got the same answer…not yet! I made an appointment for the following week for a “sub-brow upper lid blepharoplasty with local anesthesia. 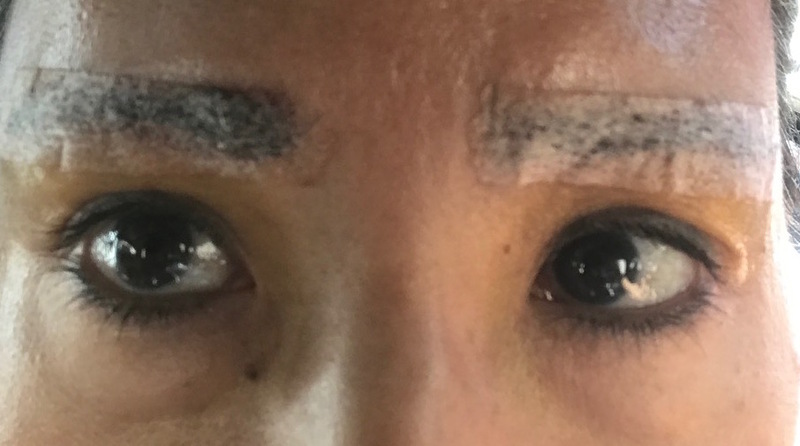 For patients with eyebrows at the normal position, sub-brow lift will be the more adequate method to correct sagging eyelid. 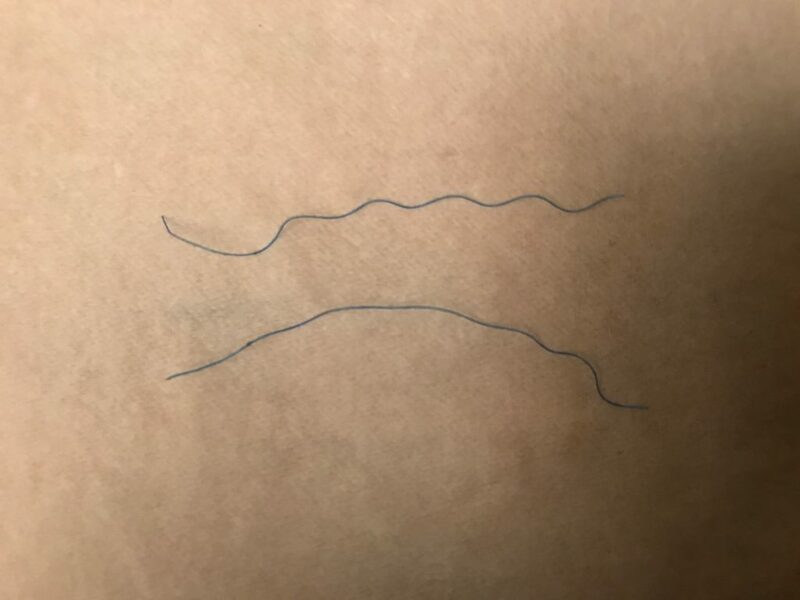 This method is especially useful for older patients who have lost elasticity in the eyelid muscle or patients with thick upper eyelid skin regardless of the age. 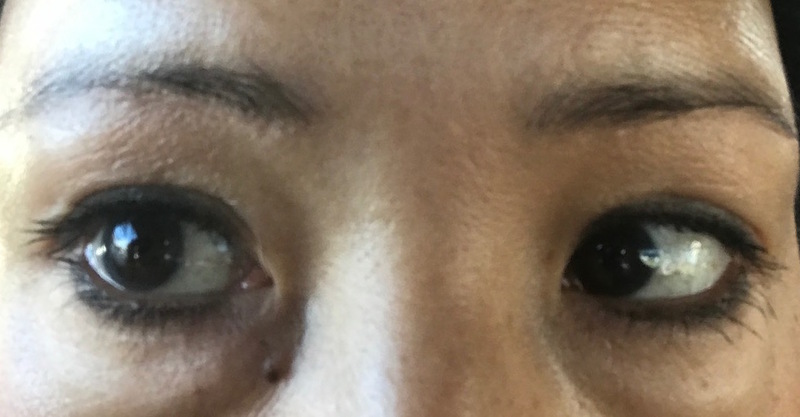 Older patients with double eyelids that were covered by the sagging eyelid will benefit from this procedure, as the surgery will reveal their double eyelid. This procedure requires an incision just below the eyebrows, and minimal-tension, meticulous suturing technique is applied that the remaining scar is less visible. This surgery is advantageous in that there is precise control of how much eyelid is lifted and crease will be shown. Photo of the procedure (not mine). Do not take aspirin, aspirin-containing products (alka seltzer), blood thinners or antidepressants for 2 weeks prior to surgery. Avoid vitamin E, fish oils, garlic and/or NSAIDS (ibuprofin, Aleve) for 48 hours prior to surgery. First 48 hours – ice as much as you can. No vigorous exercise for one week. I would like to add that it is beneficial to eat as clean and light as you can post surgery, so all of your energy can be directed toward healing. 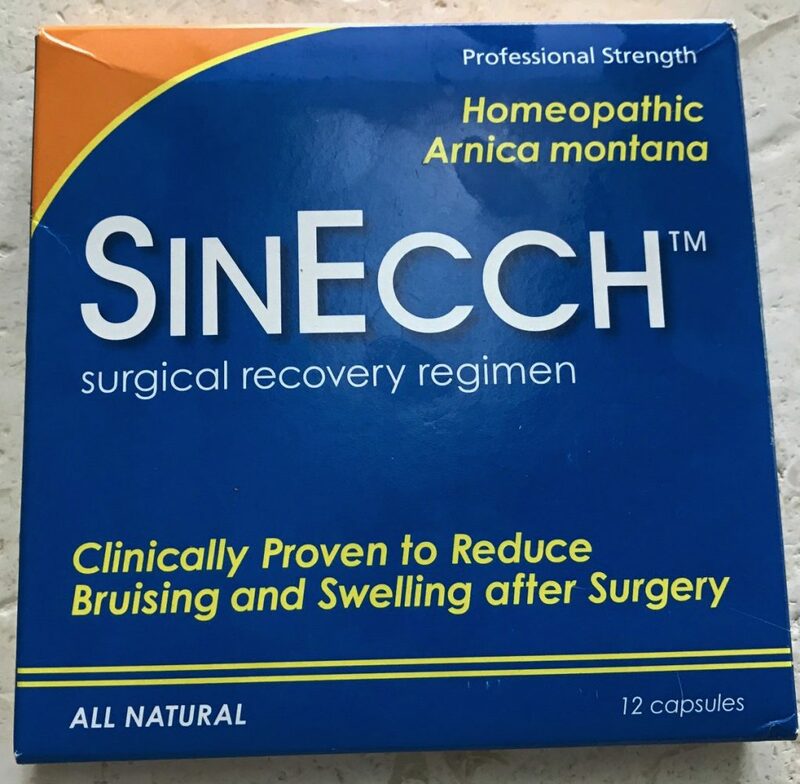 In preparation, I purchased a box of SinEcch High Potency Homeopathic Arnica online. I love this product because it is the best all natural, professional strength remedy for surgical recovery, and is clinically proven to reduce bruising and swelling after surgery. 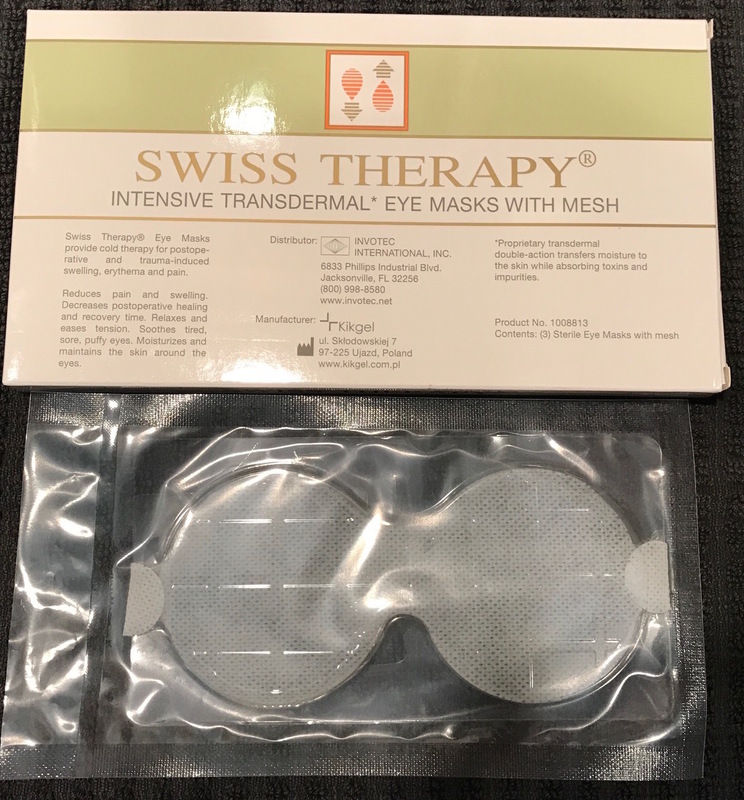 I also did some research online and purchased some cool Swiss eye masks even though frozen peas and corn are just as effective. The day of surgery, I did a sculpt class, and stocked up on green drinks and soups with little or no sodium. 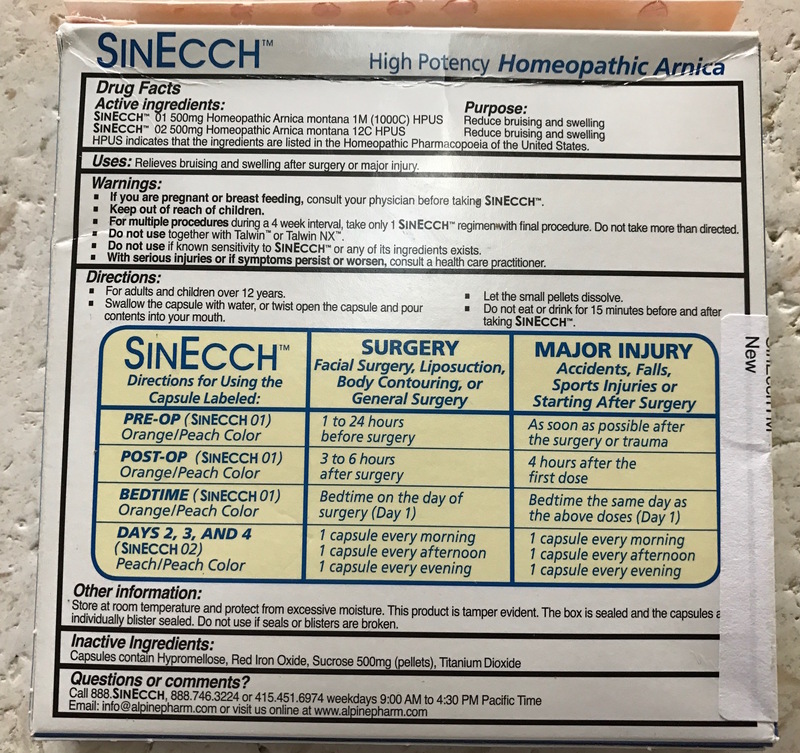 I took one Sinecch arnica pill – 24 hours prior to surgery. Day 1 – December 16, 2016; 1:00 p.m. appt. 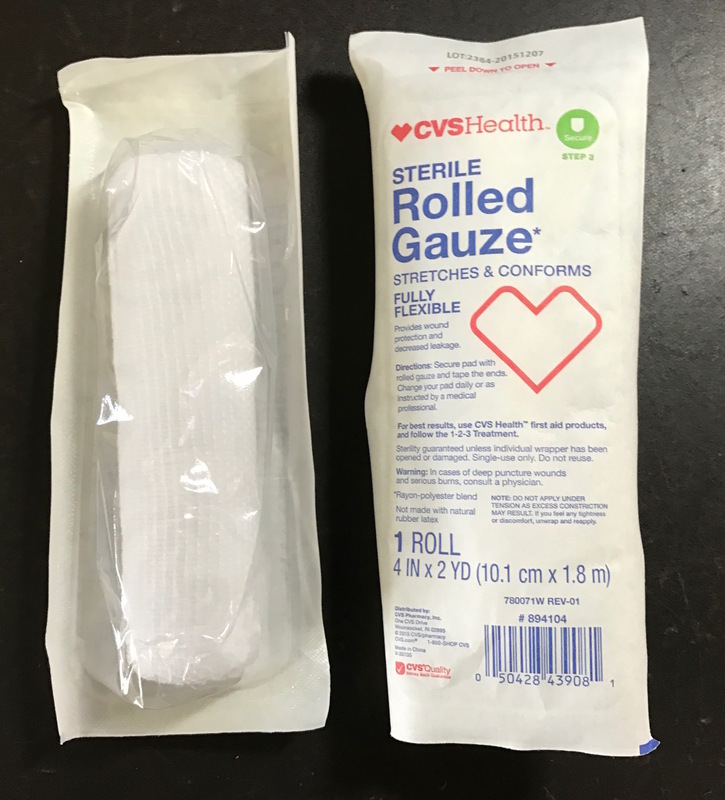 1:05 – injected local anesthesia – a harsh pinch. I could feel the needle curving under and around the shape of my eyebrow. Waited for 7-10 min for numbing to permeate into cells. have fallen asleep if it was not for a little tugging once in awhile. When I got home, my eyebrows had crusty blood on them, and I really could not see much because of the tape, that serves like a splint for the stitches, was covering them. Other than that, my eyes were pretty swollen but then my eyes get really puffy after crying in a sad movie. I thought I would be able to just hang out in bed and watch my iPad for the rest of the day. But, my eyes were tired, and I ended up icing them for the rest of the afternoon and night as I listened to self-guided meditations and did some yoga nidra. From my eyebrows, up and over to the back of my head, I was numb for eight hours. It was recommended to ice through the night, but this slumbering bear slept through for nine hours straight. I did not have to take any extra-strength Tylenol, just two more arnica pills. My eyes were still swollen but the swelling had gone down by 50%. I ran errands all day—rocking my Stevie Wonder look with the help of large shades. My eyes were a little swollen from the errands, and I iced four times that day. Took my arnica three times, and did a coffee enema to eliminate the anesthesia as quickly as possible. The swelling was down even more, so I could start to see the beginning of a full upper lid. Ran errands all day, took my arnica three times, iced four times and did a coffee enema. Swelling was all gone. Ran into a hula sister at Kahala Mall…received no funny looks. Did a coffee enema to eliminate the anesthesia as quickly as possible. Practiced restraint to keep pulling off the tape and cleaning up the dried blood under it. Instead, I trimmed the tape a little to hide better under my shades. Janene and I had a meeting with a supplier. Iʻm not sure whether she thought it odd I was wearing sunglasses. Rupali and I went on a 4-mile walk which resulted in no swelling since I had refrained from doing any form of exercise for four days. Day 8 – December 22 (tape off) 9:00a appt. Dr. Wong removed the tape and cleaned up all the blood with a q-tip and hydrogen peroxide. He wanted me to leave the stitches for another week. I did not mind because I did not have to put any more tape back on. The only catch was I would be in California and would get the awesome learning opportunity to take the stitches out myself…Dr. Wong said I healed really fast and nicely, and the stitch marks were not going to show after I was completely healed. One week after with tape still on. One week right after tape taken off by Dr. Wong. I was instructed against vigorous exercise or swimming until the stitches come out. But, I could go into a steam or sauna. I was really happy with the first week’s results. My eyebrows were a little funky from the stitching and the taping, but overall, I could go out in public without sunglasses again. *Note: One cool thing Dr Wong mentioned, with this sub-brow bleph, is that anyone with crow’s feet on their upper lids get a bonus as they are removed in the process. He said I did not have any but he did remove a lot of loose skin. With a deep breath, I took my tweezers and pulled the blue thread sticking out of the right corner of my eyebrow. It stung a little, but I was grateful the thread pulled out easily and only took a couple of seconds for each eye. Two weeks after surgery – pulled out my stitches. Day after stitches pulled out. Three weeks after Bleph surgery. The only evidence of my surgery is a very fine red line that traces along the line under my eyebrow. It is very simple to take a little cover-up makeup and cover the line. 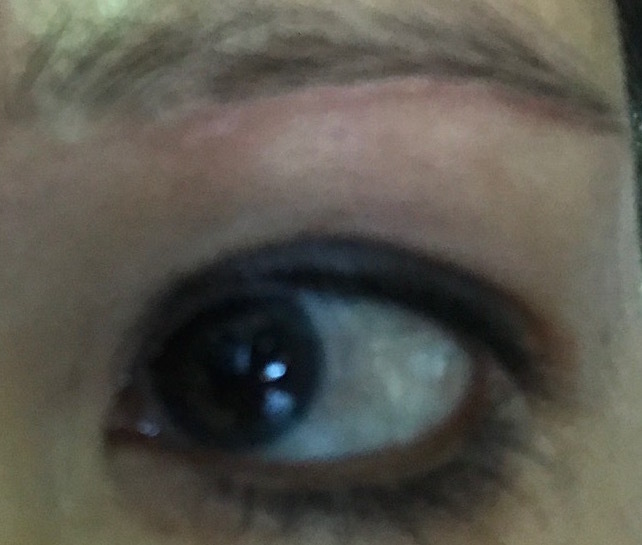 Four weeks after stitch line under left eye. 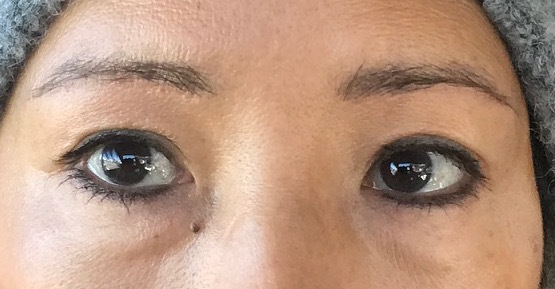 Four weeks after stitch line under right eye. It has been a month after my “Bleph” and I am so happy with the results. I wake up every morning and really look awake. It is such a subtle, finite change, but it really makes a huge difference. Many friends have commented how youthful I look, and that is the reason why I did this post. Many are so nervous and afraid to do this surgery, but I am pretty fearless when it comes to the unknown. My only advice comes back round to the Law of Attraction. It simply means, “What you focus on shows up,” and we know that can be a bad and good thing. If you decide you want to do this surgery, it is very helpful to visualize what you will look like and how happy you will be with the results. The most important thing I have learned is that no matter what you decide to do, you need to get 100% emotionally, physically and mentally behind your decision. If you have any doubts or hesitation, your results might not be as positive. I know without a doubt that my surgery was smooth and fast and my healing uneventful with the best results possible because I was all in. I had zero reservations about the surgery or any pain and had no doubt my results were going to be exactly as I envisioned. Four weeks post-op with cover makeup. Previous Post Nothing is difficult that is wholly desired. Wow such a difference. The result looks fab. I underwent blepharoplasty upper and lower at Forme clinic in my 40. I used to have saggy eyelids many years and i wanted to do something about it. So i took the advantage of surgery however i did no like to be touched my eyes and the areas. I could not to have even make up done by someone. But this was the one i really wanted and i decided to withstand. Love the result. Dr. Vasek really opened my eyes again and honestly it gives my face younger look.